I have two large tanks of Propane that I use for a heater in my house. It is a fireplace style heater, but will heat my downstairs to a comfortable level without the use of electricity. Best investment I ever made for keeping the house warm when the power goes out. 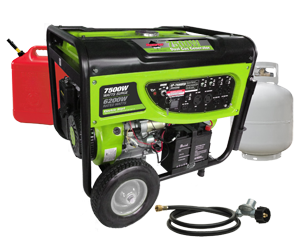 Started looking for a generator and found the ones that run on Propane. Did a lot of research on them, and have decided that I'm getting one. It is a 7000 watt unit, and should run a lot of the necessities in my house if the power goes out. It run 8 hours on a tank the size you use on your BBQ grill. My plans are to have my gas company install an adapter to my large tanks so I can run the genny off the big tanks I have. That way I should have electric for a very long time if things were to go badly. Also plan on stocking up on a couple of the smaller tanks as a back up. Can use them to cook with or run the genny. Another good feature of these are that they can refill the Propane cylinders without electricity (It is hand pumped at the place I get them refilled). So, I can take smaller tanks out and get them refilled if there is a long term power outage. Thought about going tri-fuel but decided that Propane will work for me. I have some 100# tanks here as well as some 20#. I haven't hooked up my 100#'s to it yet, but it ran fine on a 20# for about 5 hours. Very interesting. But where I live (out in the sticks). I don't have much choice of fuel source for heating the house. I'm actually installing a new Propane powered heater in the house. I currently have two 500lb tanks on one end of the house, and plan on putting 3 on the other end of the house for the heater and stove in the kitchen. So, once it is all done, I will have a lot of propane on hand. Wonder if I could in the future convert the Propane unit to tri-fuel. Just out of curiosity.